Amidst a slew of iPhone 8 leaks coming down the pipeline, the latest leak involves a purported photo of the top portion of the iPhone 8’s front glass. The photo (via Slashleaks) seemingly corroborates previous reports suggesting that Apple with the iPhone 8 will introduce a brand new facial recognition feature that can be used to unlock a device and perhaps to even authenticate secure transactions. Indeed, Apple earlier this year acquired an Israeli start-up called Realface with incredibly advanced and secure facial recognition software. The leaked photo is below and, as you can tell, there are three additional circular cutouts that are not present on the iPhone 7. While admittedly speculative, it stands to reason that these cutouts are for additional camera modules Apple plans to incorporate to support a new facial recognition feature. It’s also worth mentioning that Apple’s plans for facial recognition may extend far beyond user identification. Specifically, there has been speculation that the front-facing cameras on the iPhone 8 may be used for gaming purposes insofar that users will be able to superimpose photos of their own head onto playable characters. To this point, recall that Apple in 2015 acquired Faceshift, a company with expertise in real-time motion capture. In fact, Faceshift’s technology was used during the filming of Star Wars: The Force Awakens. A video showcasing Faceshift’s capabilities can be seen below. Incidentally, the leaked iPhone 8 part above seems to jibe with other leaks we’ve seen, as evidenced by the rendering below. 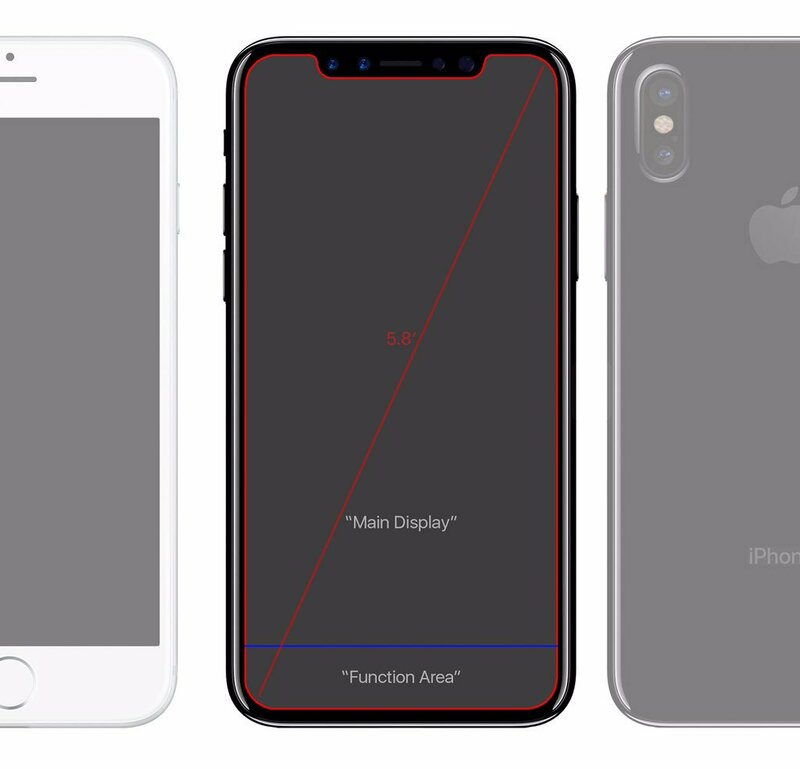 The two flaps in the upper left and right-hand corners will seemingly be used to display status icons like signal strength and Wi-Fi and, thanks to the deep blacks offered by OLED, will simply go dark when a user is playing a game or watching a movie.